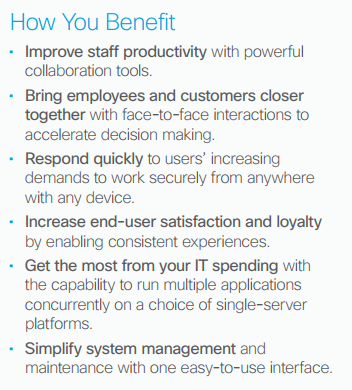 Cisco Business Edition 6000 is more than just an IP phone system. It is an all-in-one solution that solves complex communications challenges for business with up to 1,000 employees. 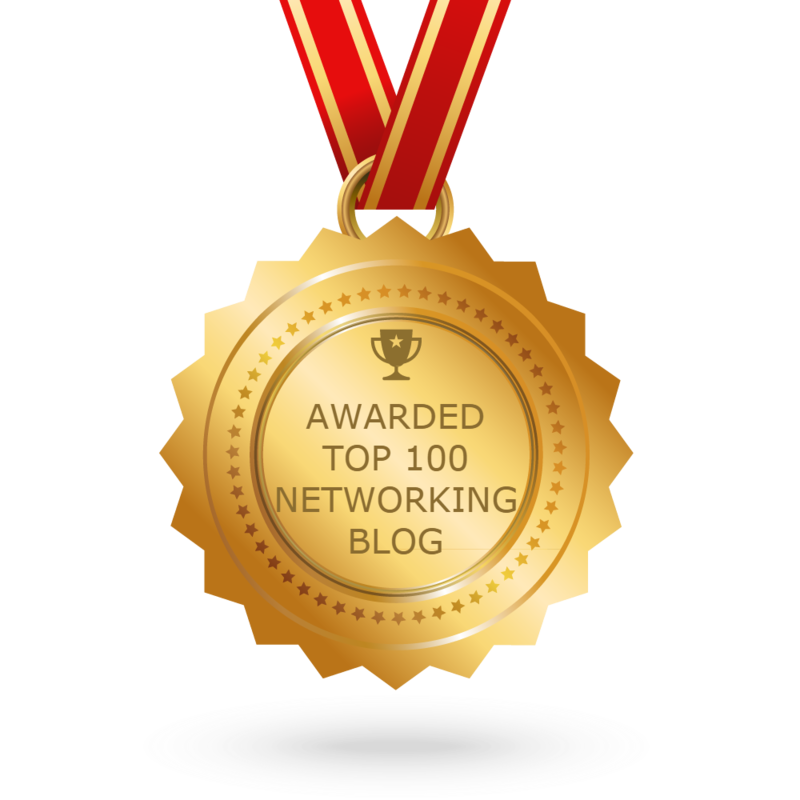 It’s the best option for you want to connect with co-workers, customers, and business partners from anywhere, using any device. Meet growing employee and business demands. Connect up to 1000 users with powerful collaboration capabilities. Embrace collaboration technology to solve challenges. Create unique, hybrid premises and cloud collaboration user experiences. The Cisco BE6000 is a family of packaged collaboration solutions that comes with all core applications preloaded and ready to run. It provides you with a single, centrally managed voice and video call control platform that scales with business growth up to 1000 users, 2500 devices, and 100 contact center agents. 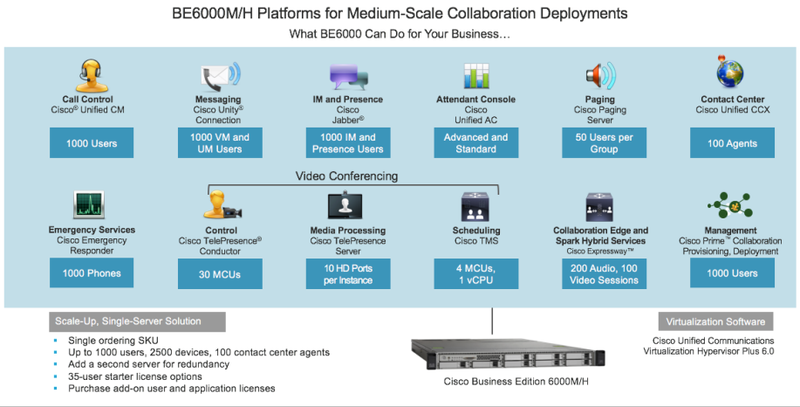 BE6000H: Supports eight collaboration application options plus one for provisioning in a single virtualized server platform; maximum capacity of 1000 users, 2500 devices, and 100 contact center agents. Ideal for medium- to large-scale end-to-end collaboration deployments. BE6000M: Supports four collaboration application options plus one for provisioning in a single virtualized server platform; maximum capacity of 1000 users, 1200 devices, and 100 contact center agents. Ideal for medium-scale end-to-end collaboration deployments. BE6000S: Supports five fixed collaboration applications in a single integrated router/gateway/virtualized blade server platform; maximum capacity of 150 users and 300 devices. Ideal for small-scale “office in a box” collaboration deployments. The servers are delivered ready for use, with a preinstalled virtualization hypervisor and preloaded software, ready to install. Specific details of BE6000 platform components are available at the links provided in following section. The Cisco BE6000 is a packaged solution that comes preloaded with virtualization and applications software. Simply turn on additional collaboration applications as your business needs grow. This integrated router, gateway, and blade server is ideal for small sites that need basic, entry-level voice and IP telephony capabilities, together with powerful, easy-to-use collaboration tools.